Floral tributes at the monument to Pushkin. Russian Language Day is celebrated to honour the birth anniversary of Alexander Pushkin, probably Russia’s greatest poet and originator of modern literary Russian language. In India, the day was marked at the Russian Centre of Science and Culture in New Delhi. 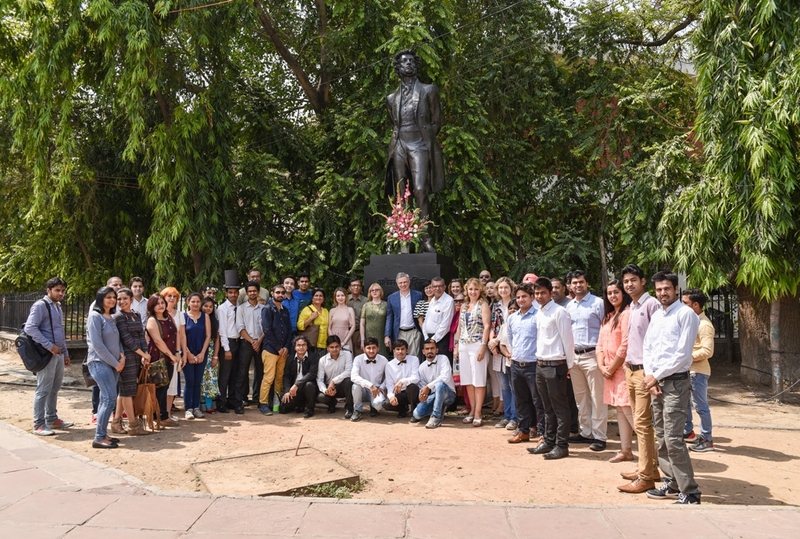 The Day of Russian Language, dedicated to the birthday of the famed Russian poet Alexander Pushkin, was marked with splendour at a function in New Delhi jointly organised by the Russian Centre of Science and Culture (RCSC), Institute of Russian Language (IRL), Russian Language Teachers’ Training Centre (RLTTC) and Indian Association of Russian Compatriots, on June 6. Beginning with floral tributes at the monument to Pushkin, among those who participated in the celebrations were Ramadhikari Kumar, President, Indian Association of Teachers of Russian Language and Literature (INDAPRYAL), Neelakshi Suryanarayan, Delhi University, Fedor Rozovskiy, Director, RCSC, Tatyana Perova, Head, RLTTC, Tatyana Shipilova, Director, IRL, and Elena Barman, President, Indian Association of Russian Compatriots. Many Russian language students from universities, schools, and Institute of Russian Language also took part. The floral tribute was followed by the Literary Carnival “Here Everything Breathes Pushkin”. The programme comprised a poetry recitation competition, a quiz on Pushkin, a literary carnival and parade of Pushkin’s characters. Perova spoke of the significance of the Day of Russian Language, coinciding with Pushkin’s birthday. Shipilova dwelt on Pushkin’s literary career and how he was a poet of the world. Participants included students from Jawaharlal Nehru University, Delhi University and the IRL, RCSC, who recited Pushkin’s poetry brilliantly in the Russian language. The poetic and musical performance based on Pushkin’s writings by Indian students of Russian language and presentation of characters from Pushkin’s works in their original costumes was impressive. The students recited Pushkin’s poetry not only in Russian, but also in Hindi and English. The winners of Russian language competitions and the literary quiz were felicitated with certificates, trophies and Russian souvenirs by Kumar, Suryanarayan and Rozovskiy.